When are you going to win a Nobel Prize? This piece was written by Ben from the Literature Review HQ. Ben describes his blog as a “Literature review how to – from beginning to end”. In this post Ben reflects on his own PhD journey now he has some distance from it. You can find a permanent link to the Lit Review HQ on the right side bar of the Whisperer under ‘Blogs like us’. 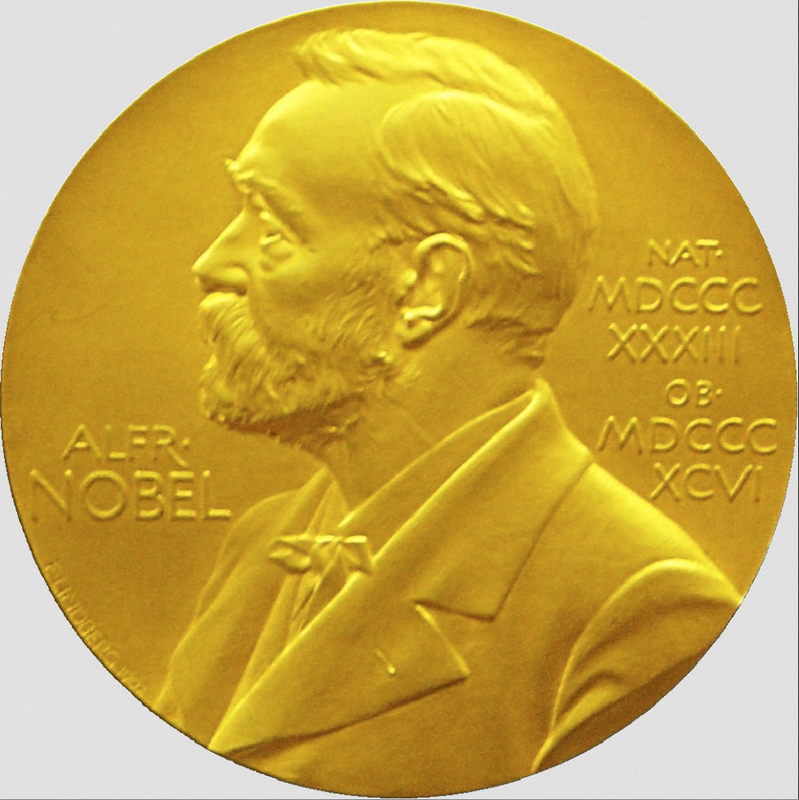 In this post Ben waxes lyrical about the Nobel prize and wonders: what does it take to get there? Sorry, that’s academic speak that makes them sound like they were keynotes at a conference or something. …they were treated like rock stars. I’ve never seen an academic crowd go so wild, it was incredible and so…so inspiring. I thought I’d write this article to highlight some of the things that inspired me and some of the common traits they shared that I think make them successful. So what makes these Nobel Laureate so successful? They all went down the rabbit hole. Their research was driven by a deep curiosity and a need to understand their subject better. It was obvious and it made me think. Results and targets for research are getting so specific and strict these days, that curiosity often takes a back seat. It’s always troubled me that you can find yourself going off on a really cool tangent, only to feel yourself being abruptly reeled back in to focus on “the money” project. Seeing these Nobel Laureates speak made me see just how important it is to nurture our curiosity at all costs. Being curious will lead us to do things that we could never imagine otherwise and I believe it is one of the keys to being innovative in research. They all gave great talks and they all told great stories. I think this is one of the most underrated skills in academia today. We can’t just blurt out our opinions and findings, we need to set them in context for other people to truly appreciate them. I think when we train as academics, “story telling”, “embellishment” and “elaboration” are all kicked out of us. This is clearly for good reason – we can’t make our research up. But I think this training can lead us omit narrative from our research, especially in our writing. This narrative is critical for getting people on our side, to read our papers and to fund our research. They were all visionaries, dreamers and big thinkers – not doers! Listening to some of the talks it seemed like none of them did any of the work themselves, even in the “early days”. The way they told the story though, they always had the vision and the dream. When you have a strong vision, it’s much easier to find a way to get it done and to help convince others that your ideas are worth following. Now we can’t all be Nobel Prize worthy visionaries, sitting there coming up with earth shattering ideas that we can farm out to our armies of researchers, but maybe there’s something in the middle. I know personally that it’s easy to forget the vision and the big idea when work piles up. An answer seems to be to just plough through and work harder however, this is often in great detriment to the vision of the research. Vision is the “secret sauce”, it brings all the experiments and ideas together. Thomas Südhof actually said that this was one of the most fruitful and enjoyable elements of academia. In my experience (on the whole) I’d also agree, I love collaborating. Seeing that the Nobel Laureates had so many collaborators highlighted the fact that nobody is an island and nobody does this alone. Collaborations are important for a number of secondary reasons such as politics, money and facilities but primary reason is stimulation. Good collaborations are more stimulating than downing a jug of fresh coffee then plunging your head into ice cold water. This is worth its weight in gold. You know what I’m talking about, those conversations you have at conference dinners where you get all passionate and excited about your work. By all accounts, the Nobel Prize winners go around doing this all the time. No wonder they’re so damn good. I’m making a mental note – open up to more collaborations this year. I’ve talked before about how academic arrogance can be a good thing, but in the shadows of these guys it looks nothing more like petty insecurity. While I said they were treated like rock stars, at the same time they just came across as some dudes who did some research that was interesting to them. I’m not sure if it really was humility or even if these guys are humble, but I think the appearance of humility here is a sign of incredibly deep confidence. They were confident in their work and it showed! Attitude is one of the single most important factors that govern our successes and failures. Randy Schekman’s dad was always asking when his son was going to win the Nobel Prize. No pressure right? But this gave him a unique attitude. It wasn’t a question of if he would win, but when he would win it. I don’t think anyone really underestimates the importance of attitude. We all know it’s important in theory but in the heat of a project it can often take a back seat. I wonder what would happen if we thought “I’m going to try and win a Nobel Prize with this research”. It’s far fetched of course, but if we seriously pursued such a lofty goal, even if we failed – we’d probably still be doing quite well for ourselves right? So, I’m off to write my Nobel Prize winning proposal, how about you? This entry was posted in Your Career and tagged prizes. Bookmark the permalink. Oh I love this! Let your vision loose and dream big. Yes! Even while working on the mundane things in life. It is definitely the sauce that makes life taste sweet. Thanks Ben. I love it that they all “went down the rabbit hole”…and came out again. Definitely not all Nobel Prizewinners are humble. Definitely not! What a great read. Thanks for sharing your thoughts on such an experience u had. I think the traits are correlated with each other, and to me being curious & humble are the most crucial.